Rendering of Purple Line via the MTA. Gov. 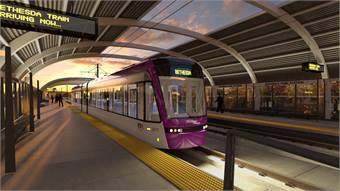 Martin O’Malley and members of the Board of Public Works (BPW) approved the Maryland Transit Administration’s (MTA) plan to deliver the Purple Line through a public-private partnership (P3). Board members also approved the MTA’s proposed competitive solicitation method for selecting a private concessionaire to design, build, finance, operate and maintain the east-west light rail line. The BPW’s approval of a P3 delivery method for this project means that a single private partner will be responsible for designing, constructing, operating and maintaining the project, as well as providing up to $900 million in private financing. The innovative project delivery method differs from a typical project in which the state separately bids for the design and construction of the transit line and then operates the system, such as light rail in Baltimore. This P3 approach is known as a Design-Build-Finance-Operate-Maintain. The Purple Line is a 16-mile light rail line that runs east-west inside the Capital Beltway between Bethesda in Montgomery County and New Carrollton in Prince George’s County with direct connections to Metrorail’s Orange Line, Green Line and two branches of the Red Line, as well as MARC’s Brunswick, Camden and Penn Lines. A total of 21 stations are planned. The total project cost is $2.2 billion, with the private sector expected to invest between $500 million and $900 million. A combination of federal, state and local monies also will be used to fund the project. Thanks to the passage of the Transportation Infrastructure Investment Act of 2013, Gov. O’Malley added $711 million in state funds for design and construction of the Purple Line to MTA’s six-year capital budget (FY 2014 –FY 2019). With the vote by BPW members to approve the competitive solicitation process for selecting a private partner, MTA will be able to issue a Request for Qualifications in the next few weeks, select the short list of qualified proposers by the end of 2013 and announce a preferred partner by fall 2014.